Nextinction by Ralph Steadman and Ceri Levy. Bloomsbury. Hardback, 224 pages, £35.00. Out now. 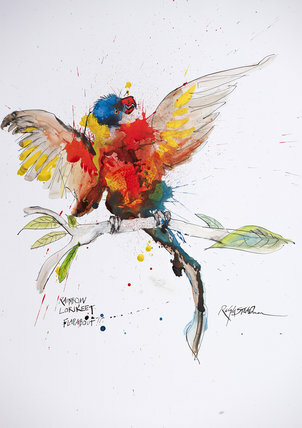 Try to describe Ralph Steadman’s influential and instantly recognisable style in one simple word and you may well come up with “life”. For over fifty years his artwork has burst forth with a frenzied kinetic energy that is the essence of life itself. A Steadman image pulses with blood and ejaculates bodily fluids; it is a frozen moment that assaults the senses, the closest that a static painting can come to representing true movement, and a direct challenge to any frames, pages, books or billboards to attempt to contain it.